Glamping is the beautiful art of luxury camping. The word is derived from the combination of the noun ‘Camping’ and the adjective ‘Glamorous’, to create a term that has in recent years become synonymous with one of the biggest travel trends across the world. The popularity of Glamping comes down to the fact this unusual form of travel allows you to experience more of the great outdoors, it allows remote areas of the world to be opened up while still allowing travelers to enjoy a sense of luxury and indulgence that would ordinarily be lost in the wilderness. Glamping sites allow you to get closer to nature, as well as being tremendously Eco-friendly in comparison to traditional hotels. 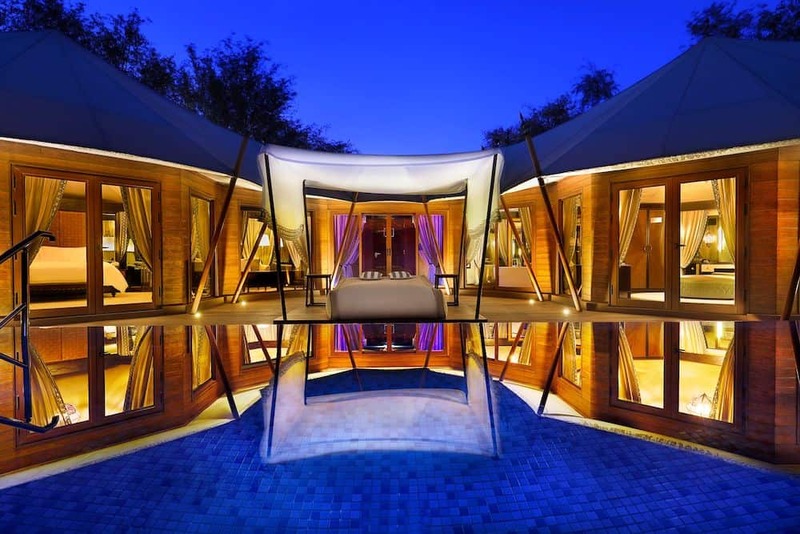 A glamorous Safari tent can be set up easily to allow visitors to see animal migrations in Africa, or extravagant camps can bring unprecedented levels luxury into the deserts of the Middle East. To inspire your next luxury escape, here are the best glamping sites in the world. 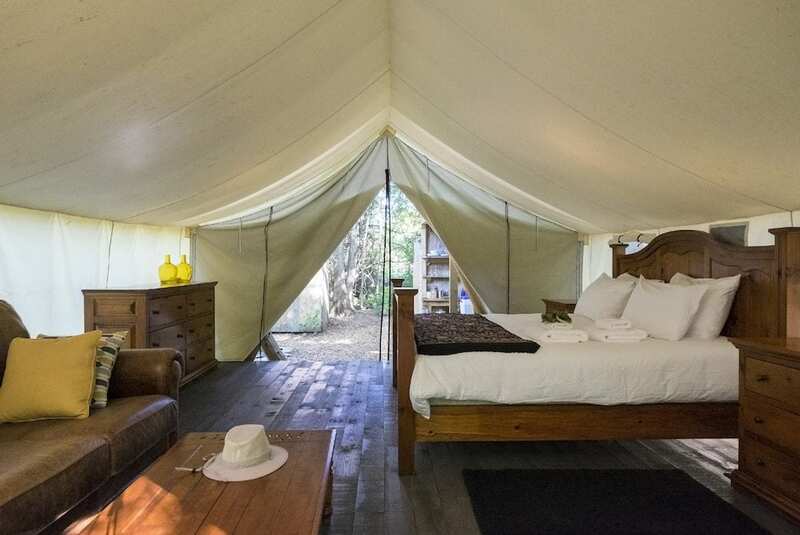 The Dunton River Camp is one of the most upmarket Glamping spots you can find in the United States of America. 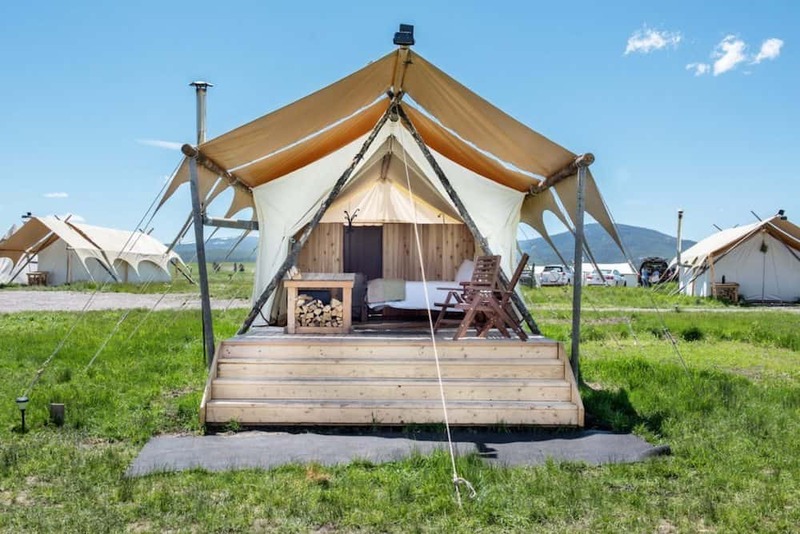 Nestled amongst the peaks of the San Juan Mountains in Colorado, the Dunton River Camp offers its guests unparalleled luxury tents in stunning surroundings. As the camp’s name would suggest, these glamping tents are set up overlooking the local river. A peaceful, green wilderness surrounds the camp and provides a glorious retreat from the outside world, because this really is the middle of nowhere. This river camp provides everything you would ever need in the wilderness and a lot more too. 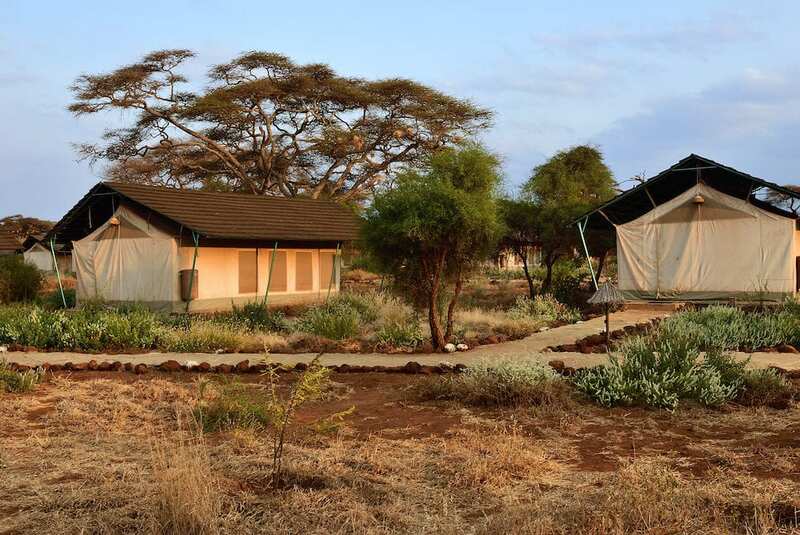 As well as individual, tented suites that contain bathtubs and verandas, the camp hosts a Spa Tent where you can enjoy a relaxing scrub or massage as well as a rustic farm cabin where you can enjoy meals and drinks. 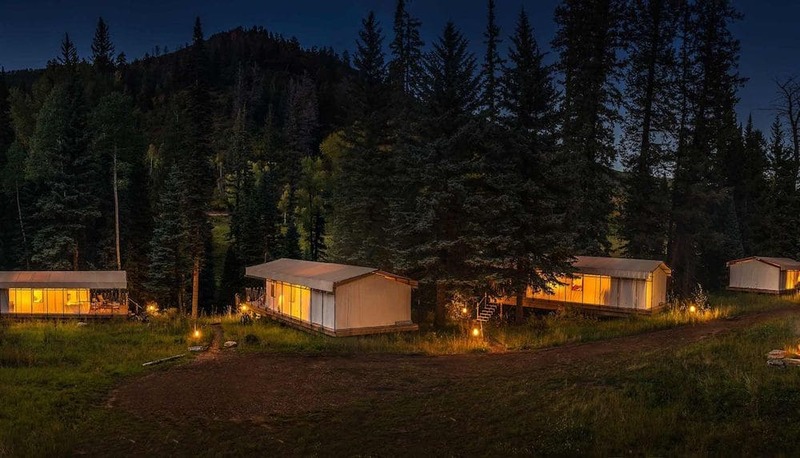 Spend your day hiking through the forests and mountains of Colorado before retiring to the Dunton River Camp for an indulgent yet relaxing evening. 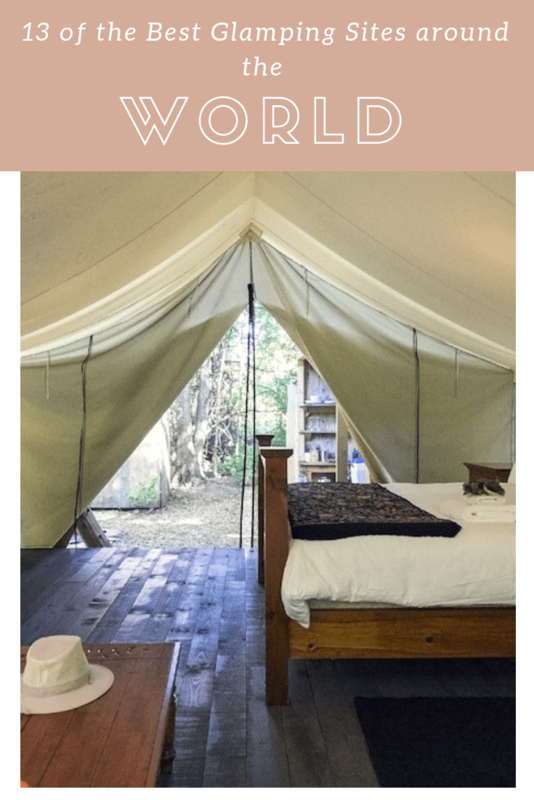 Glamping Yellowstone is one of the best ways to experience one of the best national parks in the US. Yellowstone National Park is large enough to encompass areas that stretch across three states, with parts of the park being located in Wyoming, Montana, and Idaho. The Yellowstone Under Canvas camp site is found in the Montana portion of the park, close to one of the main entrances and allowing easy access to all the natural attractions within the boundaries. Despite the proximity to the main gate though, Yellowstone Under Canvas is still surprisingly secluded and found in an area of beautiful wilderness. You can easily travel to Yellowstone’s most impressive sights, including the powerful geysers, the Mammoth Hot Springs and all of the unusual volcanic attractions that the park is so famous for. The luxury tents are complete with en-suites and terraces, while an onsite restaurant tent provides great meals during your stay at Yellowstone Under Canvas. Located on the west coast of Canada in British Colombia, Clayoquot Wilderness is a luxury experience that takes the idea of isolation to an entirely new level. This is extreme wilderness, so much so that the only way into the camp is on a chartered float plane from Vancouver that lands in the nearby river. This is a quiet place, a secluded location and a luxury glamping site that can be rivaled by few others anywhere else in the world. Due to their seclusion and exclusivity, Clayoquot Wilderness only offer 3, 4 or 7 night bookings and their season only runs from May through to the end of September, ensuring that spots are always going to be limited. 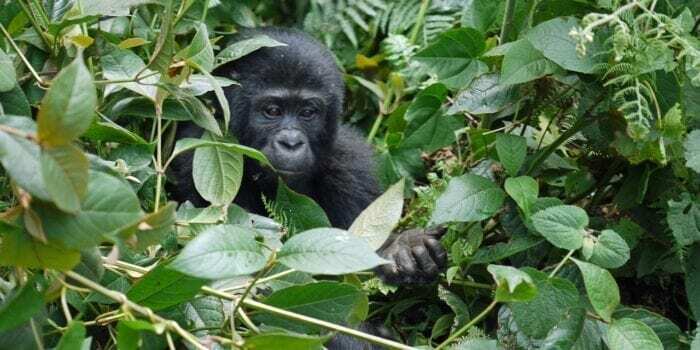 As well as canvas suites they offer helicopter tours, personalized excursions along the rivers and through the wilderness and close encounters with the local wildlife. While glamping might seem more at home in the wilderness, in Chicago you can enjoy the novel experience of Urban Glamping. The Gwen Hotel on Michigan Avenue offers glamping near Chicago. This new initiative is a chance to combine an outdoor activity in an urban environment, and with glorious views too. 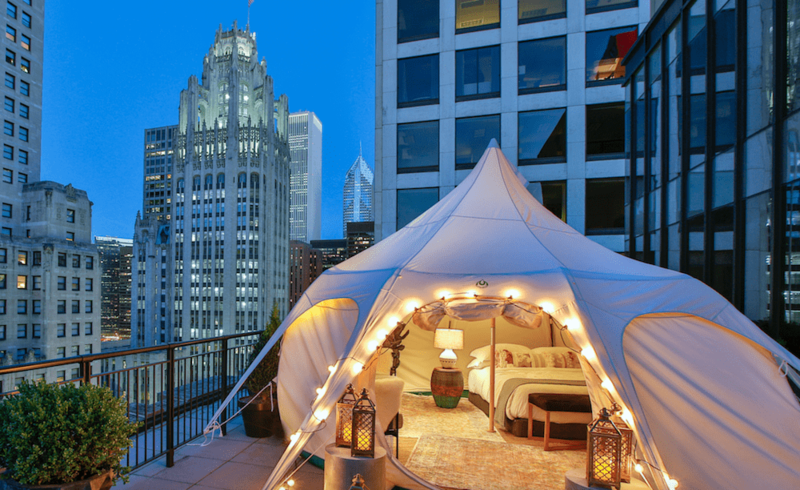 The luxury canvas tent is set up on the hotel’s 16th floor terrace, offering sweeping panoramas of Chicago. Guests also have access to the attached hotel suite, a more traditional room with extravagantly luxurious furnishings and even the service of a personal gourmet chef. Karijini National Park is a remote, isolated destination in the middle of the Pilbara region of Western Australia. This is one of the most diverse and extensive national parks in the entire country and is best known for the long, winding gorges that dramatically cut through the otherwise flat, red landscape. This is Australian Outback at its best, where red dust and rocks are sharply juxtaposed against the occasional crashing waterfall and green springs of the deep canyons. At the Karijini Eco Retreat, you can experience the spectacular gorges while staying in canvas tents overlooking the sweeping landscapes. 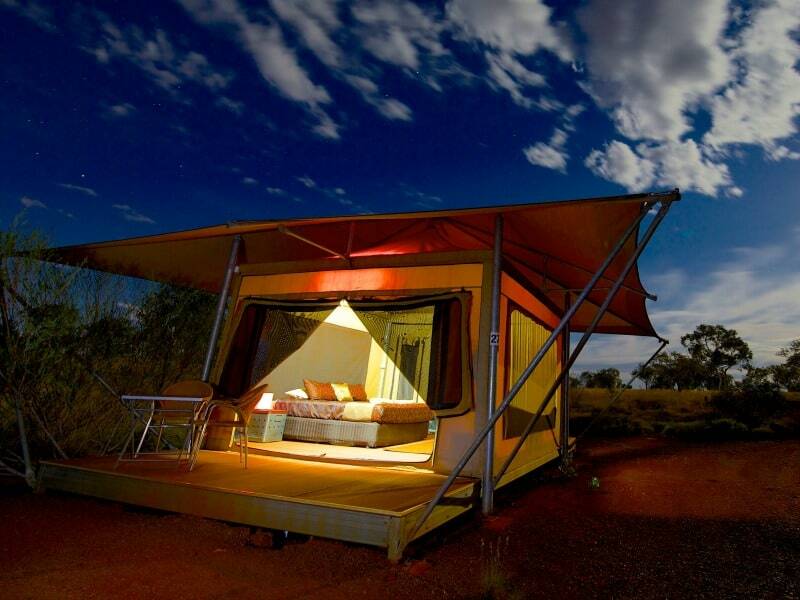 With Eco-friendly facilities, spacious interiors and an Outback Dining Restaurant run by top chefs this is one of the greatest glamping experiences in Australia. The Sahara is a destination that conjures images of sweeping deserts and towering sand dunes as far as the eye can see. It’s a land that has been the domain of nomads and caravans for centuries. Today though, it’s possible to experience just a small part of the mystery of the Sahara Desert, and to do it in style too, at a luxury glamping resort. The Sahara Desert Luxury Camp is found near the village of Merzouga in Morocco and offers its guests an elegance matched by few other glamping retreats. The traditional tents will take you back to a distant past, while the majesty of the sunrise and sunset over the enormous dunes that surround the camp will leave you quite literally breathless. 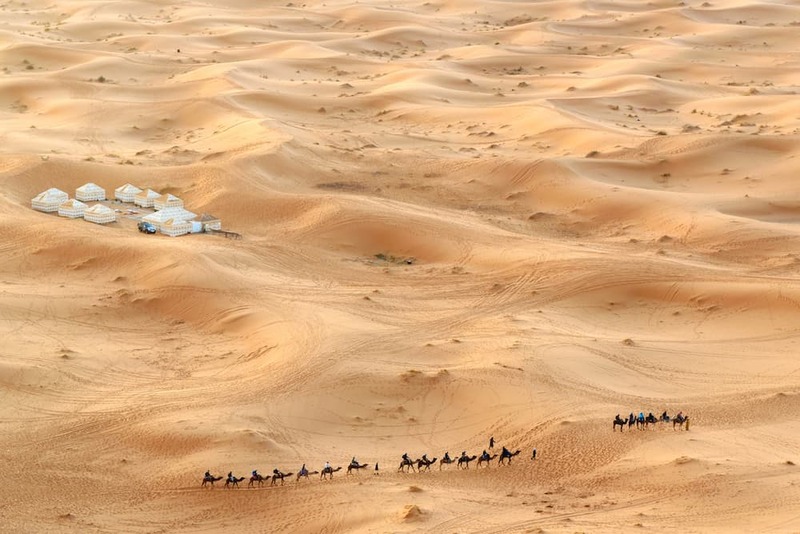 The Ritz Carlton is a name that’s usually associated with traditional, five-star hotels, but in the Al Wadi Desert in the United Arab Emirates, it’s a name that has taken on all the history and legacies of the Bedouin to create a unique luxury glamping experience. This is one of the world’s best glamping resorts, in one of the world’s most spectacular destinations. Spend the night in the shadow of sand dunes in a tented villa overlooking the desert. These canvas suites come with their own private pools, and you can enjoy the dark skies of the Al Wadi as you relax in your very own spa. Spend your day exploring the desert, taking on extreme dune bashing or learning from locals about traditional Bedouin way of life in this harsh but somehow majestic land. The Zarafa Dhow Suites is a wonderfully elegant glamping resort that will allow you to experience the wonders of an African Safari in utmost comfort. 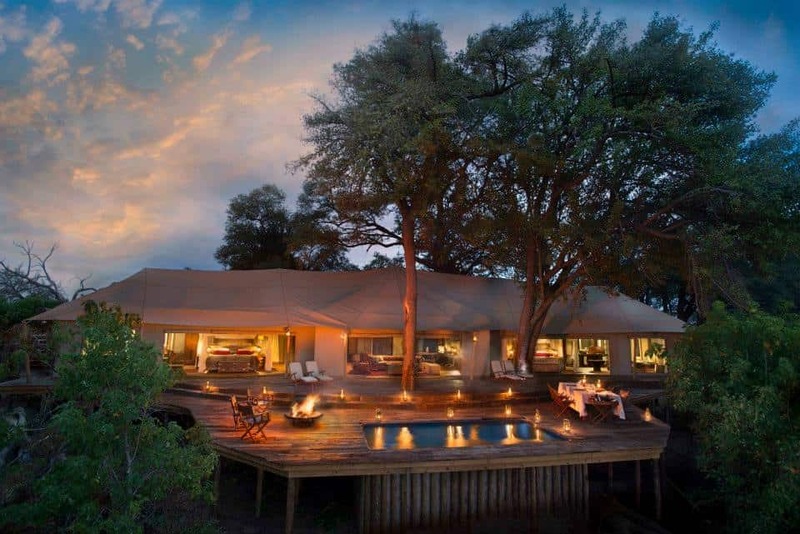 The suites are located in northern Botswana amongst the plains of the Selinda Game Reserve. 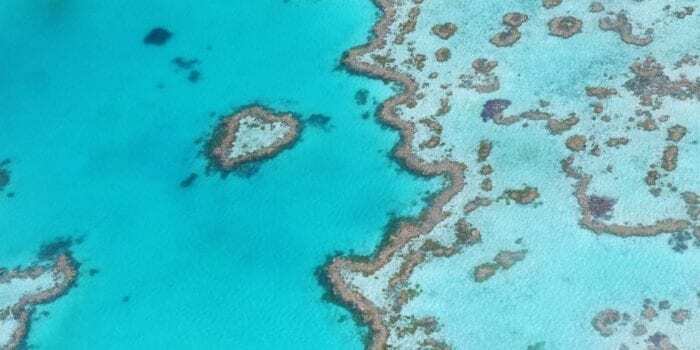 This is a private concession, an isolated and remote area of wilderness, and the only way in or out is by private charter, ensuring that this remains an exclusive destination. The extravagant, vintage style suites have their own swiming pool, multiple rooms and access to a personal chef. Knowlegable local guides will take you into the reserve, and allow you to experience the rare animals found in the surrounding area on game drives, while you can even take to the local lagoon and enjoy wildlife spotting on a cruise across the water. Located amongst the beautiful landscapes of the Masai Mara Game Raserve in southern Kenya, Cottars 1920’s Safari Camp will take you to a distant past when the romantic notion of the African safari was being born. This is one of the oldest running safari camps on the continent and they have been run by the same family for 100 years (since 1920 of course). In all those years of operation they have refined their business and offer one of the more premium products in Kenya, providing luxury glamping tents in a secluded area, where you are guaranteed to see some of Africa’s most iconic wildlife. Enjoy private game drives at night and during the day and return to your canvas suite to indulge in the opulent ameneities awaiting you at Cottars 1920’s Safari Camp. The Bush Rover Suites are a completely unique tented experience in Tanzania, because unlike most Safari Camps, this one is mobile. The Bush Rover Suites makes use of converted Land Rovers that have been equipped with luxury rooftop tents. The camp moves around throughout the season, but can be found somewhere in the spectacular landscapes of the Serengeti, in Tanzania. This is where the Great Migration takes place, as millions of animals move from Tanzania through to Kenya, taking months to complete an arduous and dangerous journey. Throughout the migration, the Bush Rover Suites periodically pack up camp and relocate to ensure that their guests are always in the optimum location to watch the best of the enthralling migration. 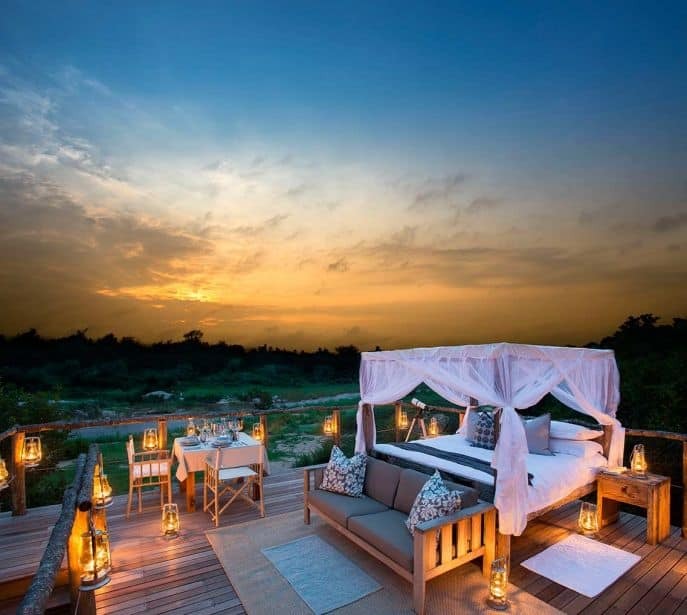 The rooftop tents are elaborate, with elegant furnishings and outside viewing terraces where you can sit back and watch the wildlife roam through. Tinyeleti Treehouse is a luxury camp that’s found in the sprawling Kruger National Park in South Africa. The elegant tree house camp offers elevated overnight experiences on raised platforms surrounded by forest, that provide exceptional views across the park. Watch the wildlife move around you as you sit back on your rooftop, tree house terrace for one of the best safari experiences in Africa. If you are looking for a luxury glamping experience and the opportunity to see tigers in the wild, then look no further than Aman-i-Khas. 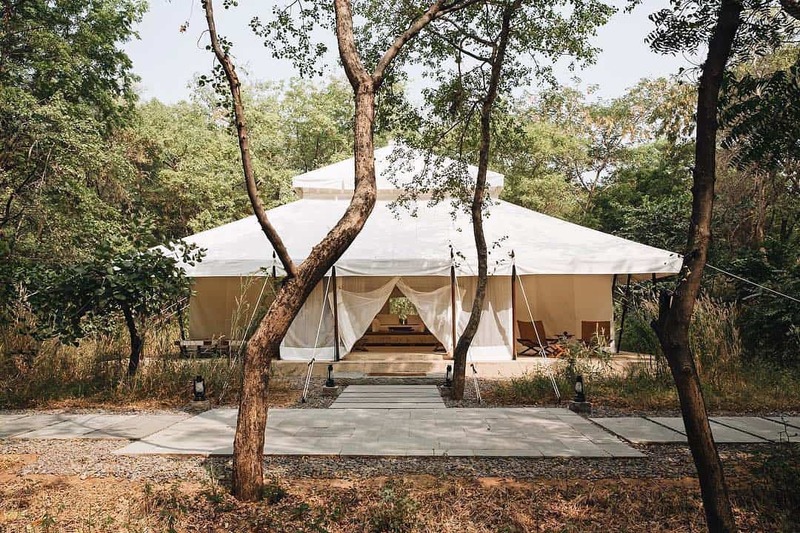 This is India’s premier glamping resort and it’s found on the edge of the dense Ranthambore National Park. 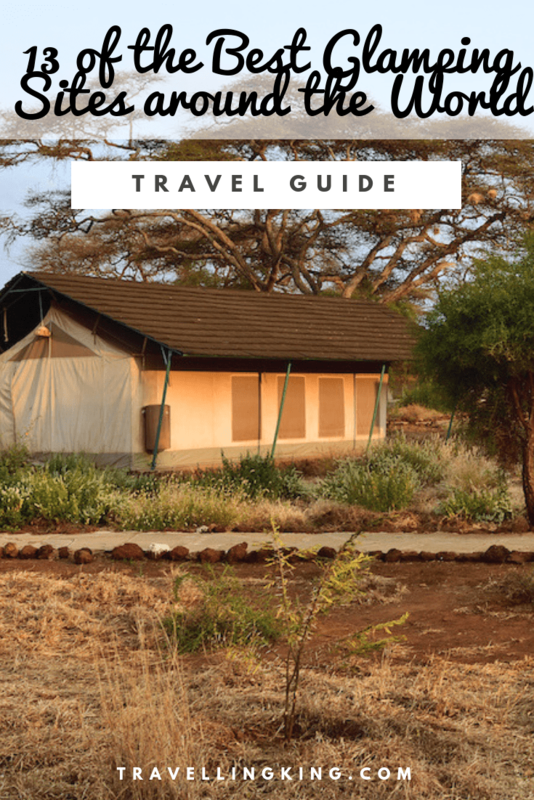 The tents are fashioned in traditional local styles and offer relaxing escapes in the forest, while nearby, you can join game drives searching for the rare and elusive tigers that live nearby. The Amanwana is a luxury retreat that’s found on a remote island off the coast of Sumbawa in Indonesia. 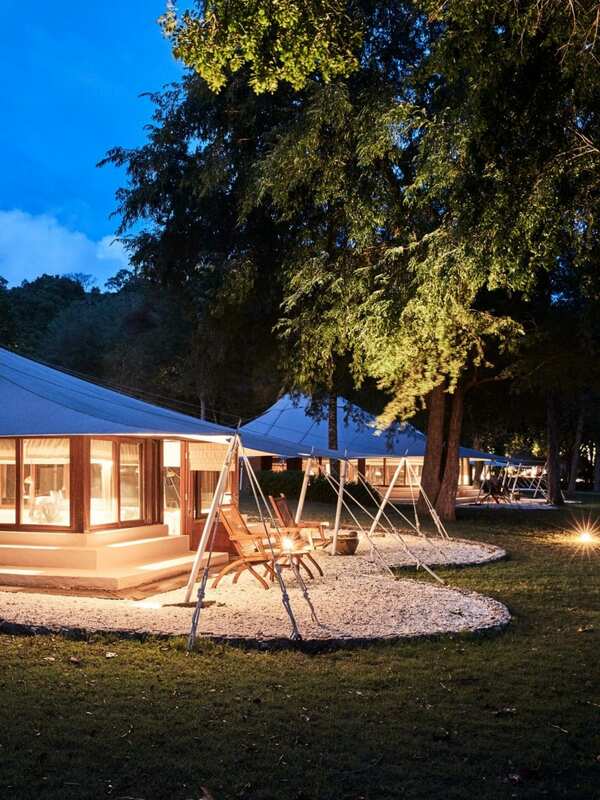 Here you can find luxury tents surrounded by rainforest and fringed by white sand beaches. There are waterfalls nearby, snorkelling off the shore and luxury spa treatments awaiting you after a day of adventuring.